Susan Kliewer, a native of California, has lived in Arizona for nearly 37 years, five of them at Marble Canyon Trading Post in a remote area of Northern Arizona near the Colorado River. Dreams of horses, deserts, canyons, rivers and sunsets have been her constant companions since she was a child. A painter since the age of 10, she turned to sculpting in 1987 after working in an art casting foundry for 10 years. 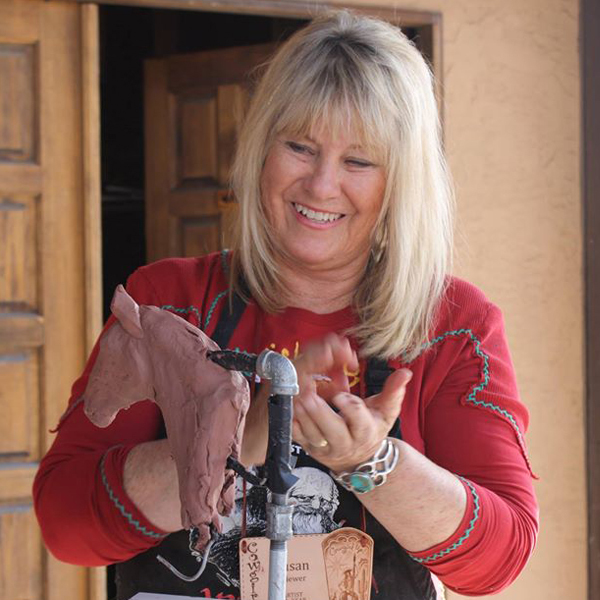 Susan won a competition to create a monument of Sedona Schnebly, in honor of one of the founders of Sedona, Arizona. The ten-foot tall bronze figure was installed in front of the Sedona Library in 1994. Kliewer's life-size fountain portraying the Sinagua people and a fountain of a Hopi Water Maiden are also to be found in Sedona. "My work" Kliewer says, "aims to show the common thread that underlies all human experience, and which I hope brings us to a greater understanding between all peoples." She often uses her Navajo friends and grandchildren as models to capture that special intimacy which is the hallmark of her work. Her depiction of the ways of Native Americans in everyday life, from the past as well as the present, has attracted major collectors from all over the world.